The kids and I have been to dozens and dozens of libraries in New York State. 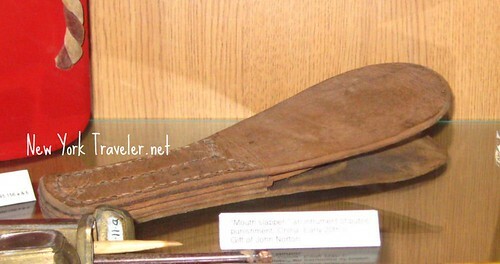 It was a real treat to visit the Cazenovia Library in Cazenovia, NY, and see their Museum of Oddities. It’s a place with more than just books; there’s a micro-museum packed into three rooms of the oldest section of the library, but it was quite an adventure! There’s a mummy in this library! First, a little history (of course!). 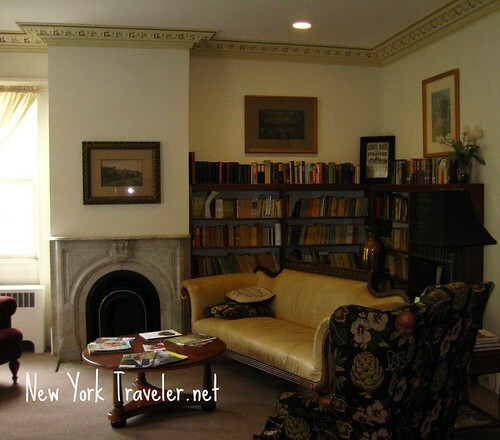 Cazenovia Library was founded about 165 years ago. 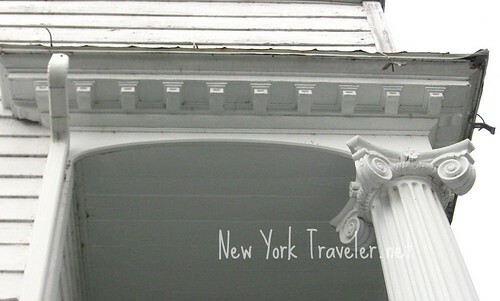 It’s a beautiful Greek Revival building. 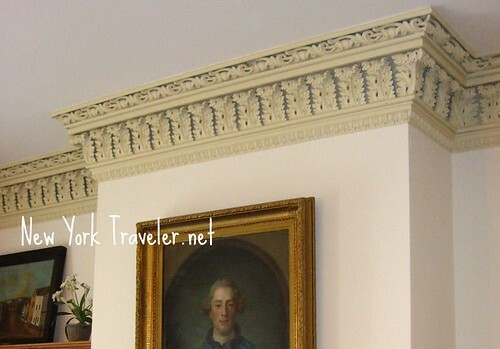 I love this style of architecture. Half of the building is the original structure, and half is newly built. The new wing is very nice. And there’s a resident pet cat in the library! Her name is Jesse and she is an absolute darling. There’s also a beautiful garden right outside the back door. 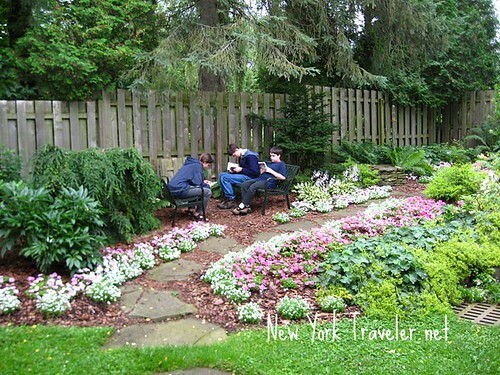 The flowers were lovely and this sitting area is so peaceful. The original library building was purchased by prominent businessman Robert J. Hubbard. He also contributed to the vast collection of museum pieces, including a real mummy from Egypt! Imagine! There’s a 2,000 year-old mummy in Upstate New York! Well, I musn’t get ahead of myself. We wandered the library a little. The older half of the building is just beautiful. There are several rooms displaying all sorts of… well, oddities! I took loads of photos, but here are the most unique of them all. 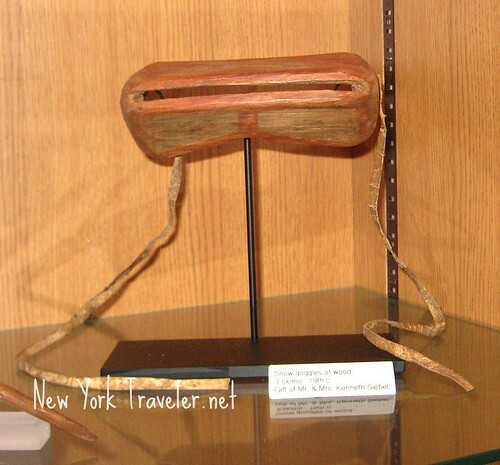 There’s the wooden snowgoggles from a 19th century Eskimo. Here’s a 19th century Tibetan brass belt, with amber stones. Here’s a 20th century Chinese mouth slapper! LOL! I have a hunkering that Chinese youths never talked back to their elders. 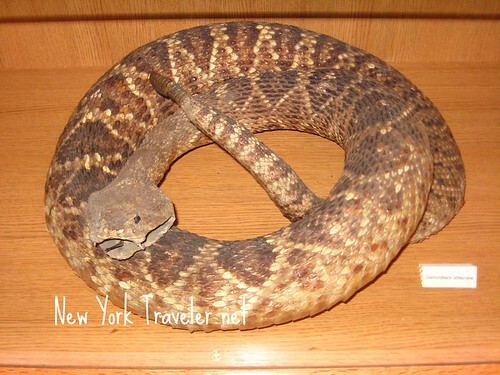 Here’s a stuffed Diamondback Rattlesnake. You can’t assess the size of the snake from the photo, but the thing is huge. His head is about as big as my hand. I shudder to imagine the bite of such a thing. I don’t want to make this post too terribly long. I’m going to end it here. The next post will be about the mummy– there’s loads of information and even a CAT Scan of the thing. 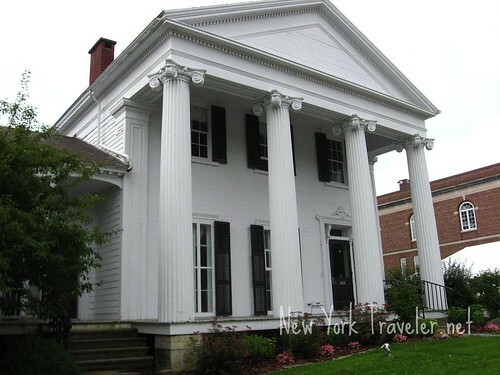 Read our post about the Cazenovia Mummy here. Howdy Daisy! We loved this library. The kids adored Jesse, the cat. Wait until you see Part Two, where we see the real Egyptian mummy and her mummified pet! I’ll bet you can guess what kind of pet it is! wow! i’d love go there!